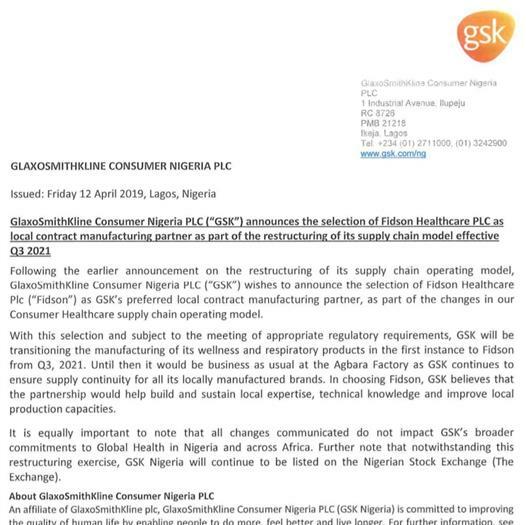 April 12 (Lagos) - GSK Nigeria ( GLAXOSMITH ) has announced that they have chosen Fidson Healthcare as their contract manufacturing partner from Q3 2021 onward. GSK earlier announced that they will be exiting the manufacturing business in Nigeria and will concentrate on supply chain only. They already sold their drinks business to Suntori group 2 years ago. This could be a positive for FIDSON stock but it remains to be seen whether they can adopt to match the international standards of GSK as is mentioned in the announcement. Shares of FIDSON are slightly higher today trading at N 4.3 per unit at Nigerian Stock Exchange in Lagos at the time of writing this article.